Thank God I saw this one on Mystery Science Theater 3000. It's really the only way to view this warmed over piece of dookie that uses grainy stock footage and a horrible bigfoot costume as it's best cinematic effects. Thankfully director Jay Schlossberg-Cohen only has two movies to his credit [4 as a producer] so at least we have something to be grateful for! 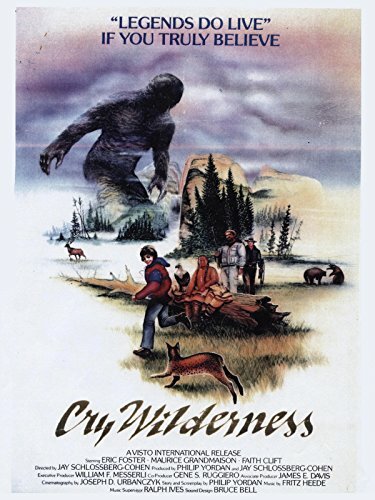 Cry Wilderness is the not-so-touching and totally predictable story of a boy and his sasquatch. Honestly, there's not anything else you need to know. Eric Foster plays the boy in question. He does an adequate job considering he's been given virtually nothing to work with. [Why the hell is a 11 year old hitchhiking in a snowstorm in the middle of the Colorado wilderness and NO ONE thinks this is odd.] When he finally catches up with dear old Dad in the wilderness we're greeted with some of the worst acting in the film at the hands of Maurice Grandmaison. Thankfully this film was the end of his acting career. Watch it and you'll know why! The cherry on this crap sundae is the prolonged fits of laughter that is truly creepy. It will haunt you for days! How this film ever got made is a mystery to me. I'll take Ed Wood's Plan 9 From Outerspace over Cry Wilderness any day. Truly one of the worst movies I've ever seen.